Nikolai Mitrofanovich Krylov graduated from the St Petersburg Institute of Mines in 1902. He was professor there from 1912 until 1917 when he went to the Crimea to become professor at the Crimea University. He held this post until 1922 when he moved to Kiev on being appointed chairman of the mathematical physics department of the Ukrainian Academy of Sciences (in fact renamed the All-Ukrainian Academy of Sciences in the year before Krylov was appointed). He worked mainly on interpolation and numerical solutions to differential equations, where he obtained very effective formulas for the errors. 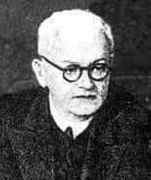 He also applied his methods to non-linear oscillatory problems in 1932 and, in so doing, laid the foundations for non-linear mechanics. The treatment is so oriented as to be readily available to the engineer or physicist. In fact, rigor is entirely subordinated to the objective of making the material as widely available as possible. Examples of physical systems are given which lead to the type of equation considered in the monograph. Moreover, general statements of methods for solving equations are illustrated by the explicit solution of examples. Before publishing this book with Bogolyubov, in 1931 Krylov had published the important monograph Les méthodes de solution approchée des problèmes de la physique mathématique. We present the fundamental results of the works of N M Krylov and N N Bogolyubov devoted to the establishment of effective error estimates for the Ritz method, the Bubnov-Galerkin method and the least squares method in connection with self-adjoint differential equations. In 1939 Krylov and Bogolyubov published Sur les équations de Focker-Planck déduites dans la théorie des perturbations à l'aide d'une méthode basée sur les propriétés spectrales de l'hamiltonien perturbateur (Application à la mécanique classique et à la mécanique quantique). This paper began their work which established the theory of perturbations and transitions of state on a new and uniform basis, both in classical mechanics and quantum mechanics. Finally let us mention three papers published by Krylov in 1947. These are Sur une propriété des suites particulières de nombres premiers impairs published by the Academy of Sciences in Paris, Sur les complexes de Galois and Sur les quaternions de W R Hamilton et la notion de la monogénéité both published by the USSR Academy of Sciences (now the Russian Academy of Sciences). In 1928 Krylov was elected to the USSR Academy of Sciences and in 1939 he became an honoured scientist of the Ukrainian Soviet Socialist Republic.